This is my all-time favorite bumper sticker! It contains the truth of GOD's Word as well as shows a picture of JESUS loving on HIS new little creation. It is such a sweet photo! I rotate this bumper sticker with a few others that show a picture of the baby. I love this bumper sticker and often get positive comments about it. It is a perfect and powerful message for all who read it. This Beautiful sticker has generated more looks and comments from people who do not know that Our Dear Lord, through His prophet, let us know how much He loves and cares for us before ever being a twinkle in our mom and dad's future. 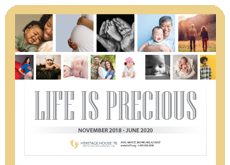 Beautiful positive message helps us to focus on the central point of the pro life message. This is a beautiful scripture that is so prolife without mentioning the ugliness of abortion - perfect message. Very high quality stickers that last a long time in the heat and sun! Powerful message for Christians to remember. The stickers are easy to apply and last a long time through the roughest heat and rain.